Magento 2 Layered Navigation is the crucial equipment for every eCommerce site running Magento platform. 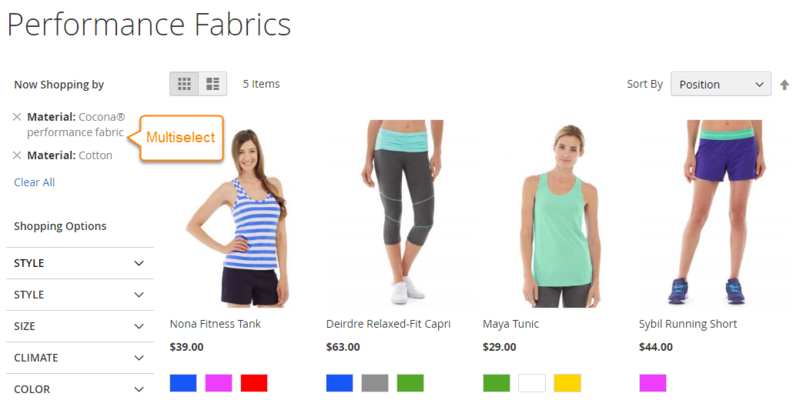 Layered Navigation module allows filter any desired items by product attributes right on the product catalog page without any navigation to another page. 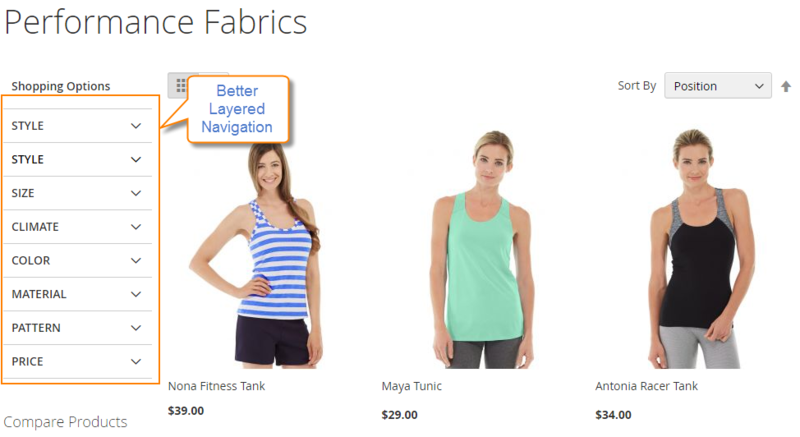 Why need Layered Navigation Magento 2? If you are still running Magento 2 store as normal without layered navigation, you will understand clearly what problems your customers must deal with. Instead of taking a favourite item in the short time, they need to filter many times on your store. It is more annoying when a thousand of goods is selling at that time. And surely it is also the big reason to take them out of their shopping cart without completing. Being aware of that the default navigation is not satisfied enough for customer’s using. That’s why you need Improved Layered Navigation extension with ajax loading and Multi-filters. This module seems to be an efficient search tool as well as a smart sitemap on your eCommerce site. By this way, the buyer can filter by many options to find products that match with their demands. Especially, with Layered Navigation module, choosing multi-select is support for the searching. 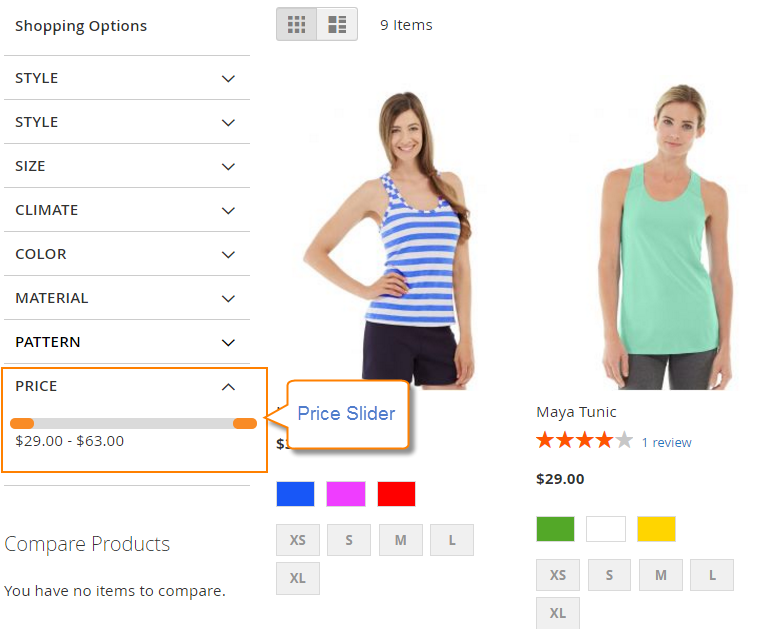 By installing Layered Navigation extension for Magento 2, a list of the product attributes including product category, price range, color, brand or any other available attribute. Depending on customer’s need, he will open characters to choose the desired option. 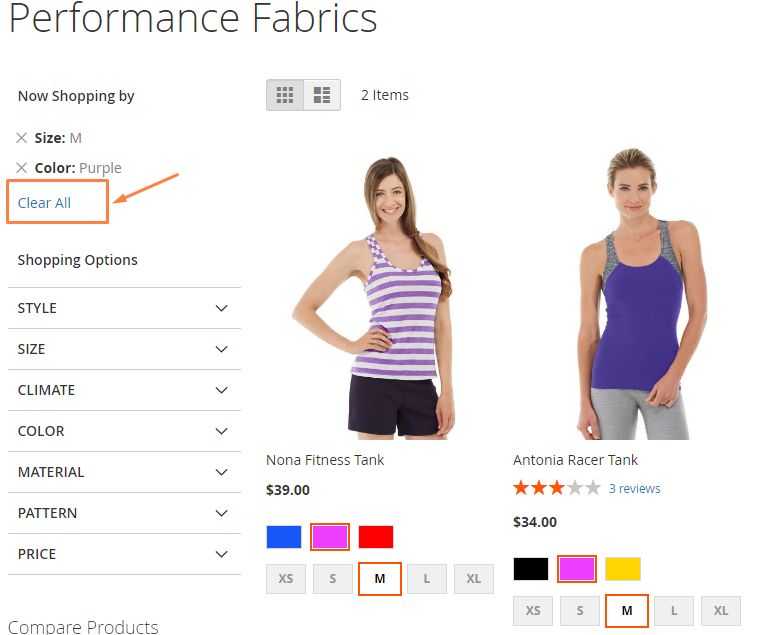 For example, if she wants to search all items that are a purple tank in medium size, select right options as need. After that, the search results will be displayed immediately on the product category page via Ajax. The below animation will show more details. Layered Navigation module comes with this most outstanding feature that allows customers to filter by multiple values of product at the same time. This means in the same filter criteria, they can ask to show all items made of different materials such as Cocona® performance fabric and Cotton. For better tracking during the filter, the navigation extension create a space to show all of the chosen options, that is called as “Shopping by”. 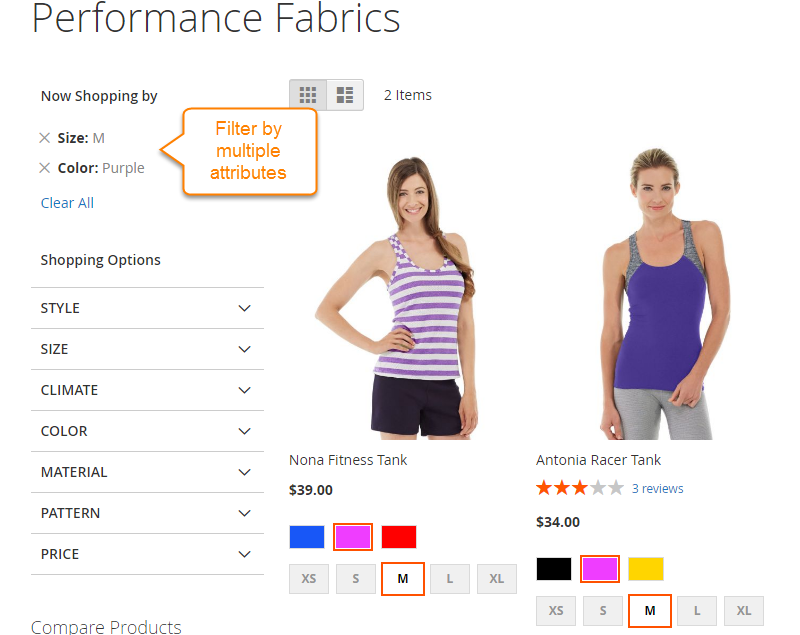 In the section, customers can see the product attributes of search results, simultaneously, it is possible to remove either individually or entirely, then start new filter. Differ from other Magento 2 extensions, Layered Navigation PRO has a very simple configuration. In the admin control, you just need to log in and enable this module on the online store. Right after installing it, your navigation will be upgraded by the advanced functionality of the improved module without complex settings. There is a cutting-edge tool designed by Our developers when it allows the user to select price range in a flexible way instead of using the fixed range in a dropdown list. The starting and ending point of the slider are the maximum and minimum price for all your products. Not only bring the comfort to your customers when filter the needed price but the price slider also takes up less space in the navigation section, that means the arrangement of your site becomes tidier as well as friendly. One of the inconvenient functions from the default navigation is that the whole page is always refreshed to show the matched results. Ignoring this awkwardness, Magento 2 Layered Navigation applies Ajax technology that enables the instant updating functionality to load only part of the page that will show all search results meanwhile there is no reloading page. It is great chance to help you improve the appearance of your product category, simultaneously, cut down the unnecessary time for waiting. Apart from the professional filter, Layered Navigation extension Magento 2 also enhances the value of URL for each result page. In your browser, the URL will be shortened like “category/medium.html” instead of “category.html?size=169”. With well-created SEO URL, it is easy for you to be in the higher rank on every search engine. That is entirely similar when you want to create a separate brand page for SEOer’s purpose, for example: “yoursite.com/url-key/nike”. If you enable Layered Navigation module on your store, regardless of the used devices as PC, tablet or mobile, the customers are able to implement the filter by product attributes easily without any conflict of screen size. The response design will bring the expected comfort whenever visitors go to your shop and find any item they need.